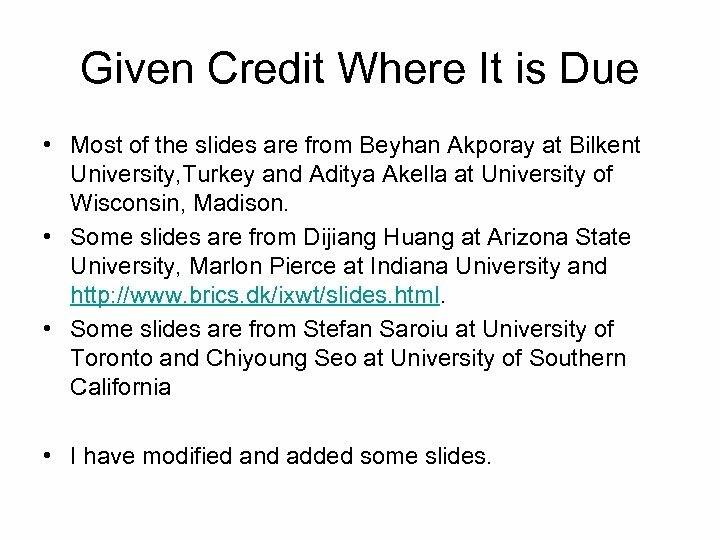 Given Credit Where It is Due • Most of the slides are from Beyhan Akporay at Bilkent University, Turkey and Aditya Akella at University of Wisconsin, Madison. 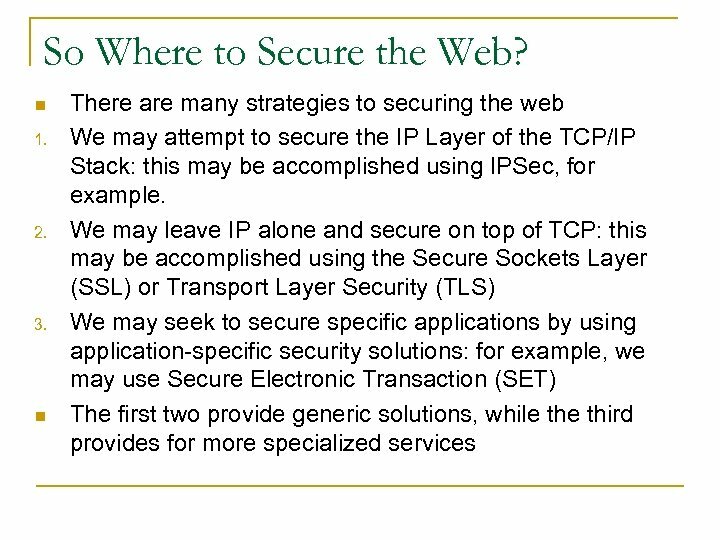 • Some slides are from Dijiang Huang at Arizona State University, Marlon Pierce at Indiana University and http: //www. brics. dk/ixwt/slides. html. 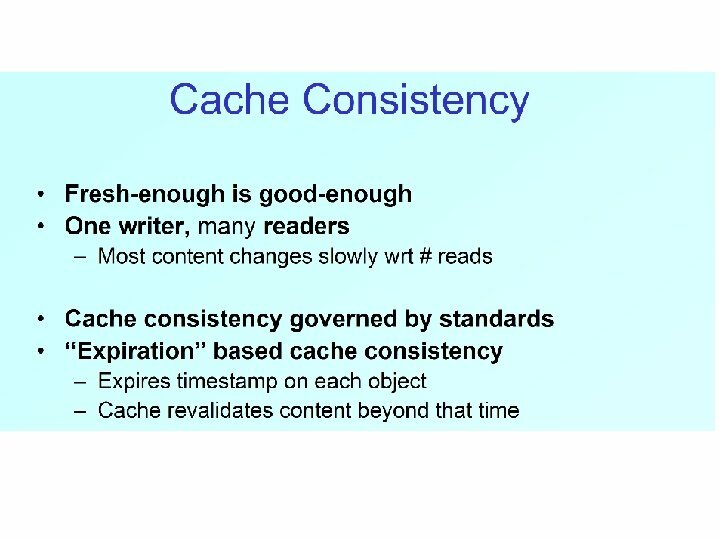 • Some slides are from Stefan Saroiu at University of Toronto and Chiyoung Seo at University of Southern California • I have modified and added some slides. 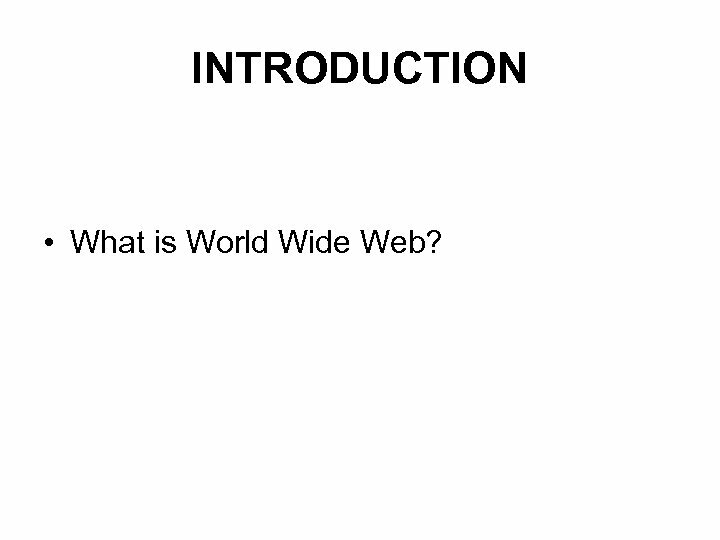 INTRODUCTION • What is World Wide Web? 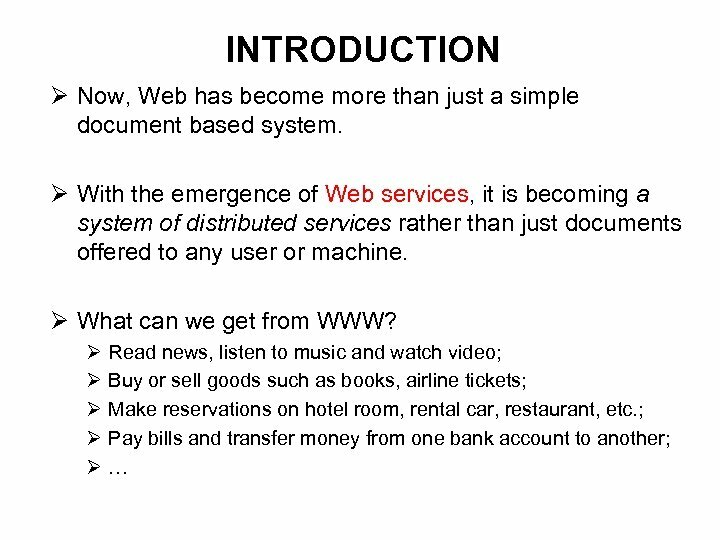 INTRODUCTION Ø The World Wide Web (WWW) can be viewed as a huge distributed system with millions of clients and servers for accessing linked documents. Ø Servers maintain collections of documents while clients provide users an easy-to-use interface for presenting and accessing those documents. 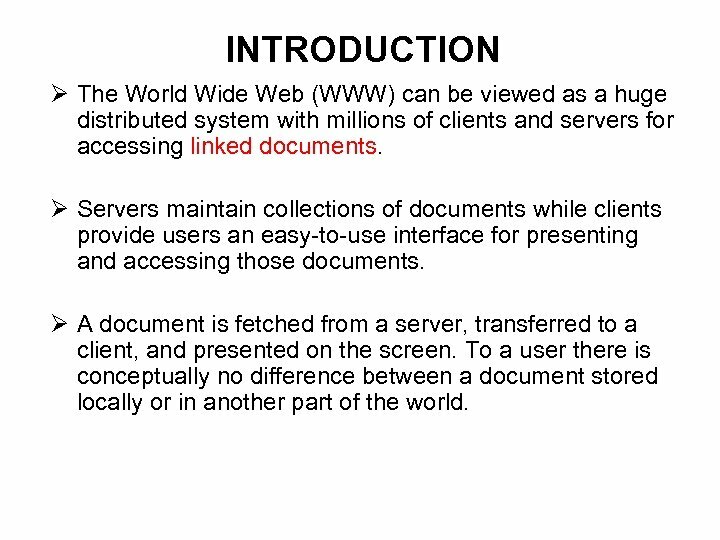 Ø A document is fetched from a server, transferred to a client, and presented on the screen. To a user there is conceptually no difference between a document stored locally or in another part of the world. 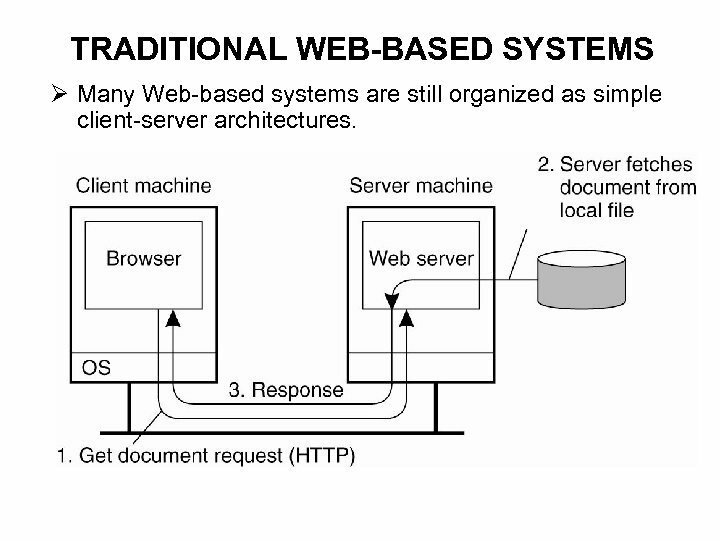 TRADITIONAL WEB-BASED SYSTEMS Ø Many Web-based systems are still organized as simple client-server architectures. 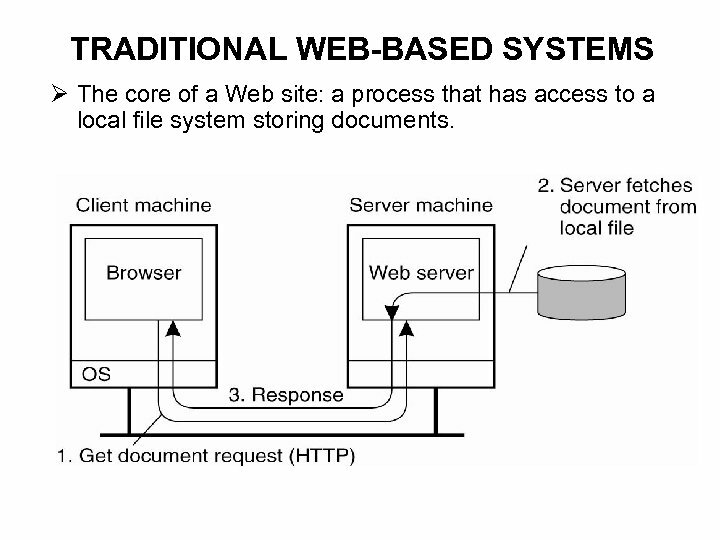 TRADITIONAL WEB-BASED SYSTEMS Ø The core of a Web site: a process that has access to a local file system storing documents. 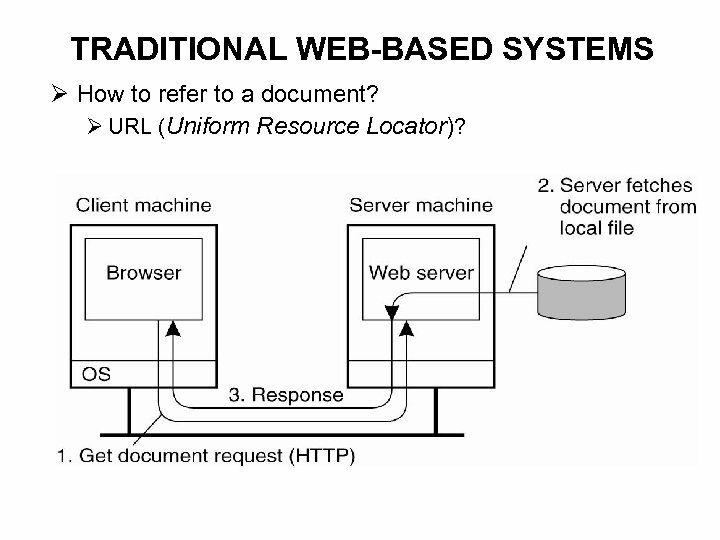 TRADITIONAL WEB-BASED SYSTEMS Ø How to refer to a document? 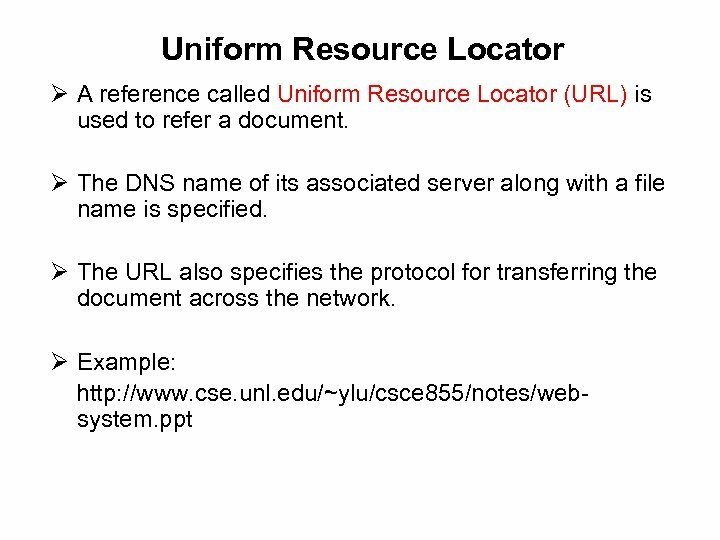 Ø URL (Uniform Resource Locator)? 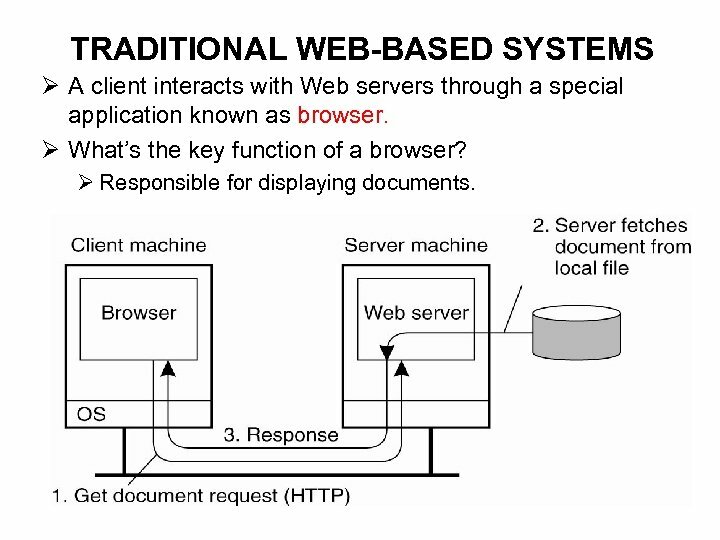 TRADITIONAL WEB-BASED SYSTEMS Ø A client interacts with Web servers through a special application known as browser. Ø What’s the key function of a browser? Ø Responsible for displaying documents. 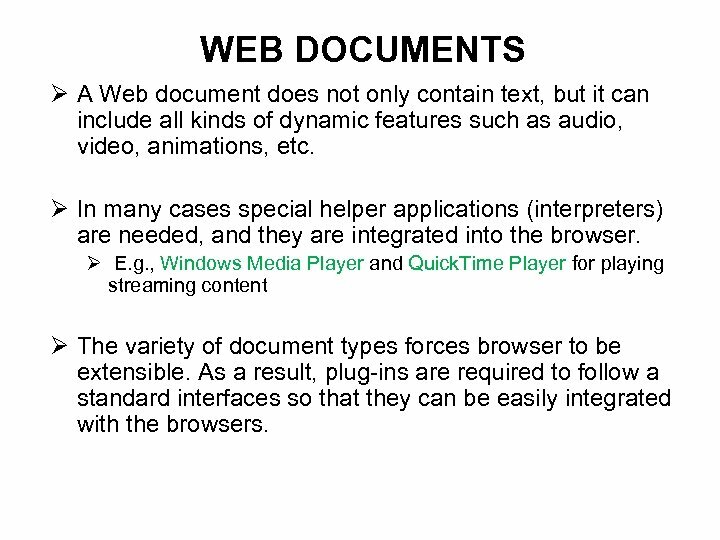 WEB DOCUMENTS Ø A Web document does not only contain text, but it can include all kinds of dynamic features such as audio, video, animations, etc. Ø In many cases special helper applications (interpreters) are needed, and they are integrated into the browser. Ø E. g. , Windows Media Player and Quick. Time Player for playing streaming content Ø The variety of document types forces browser to be extensible. As a result, plug-ins are required to follow a standard interfaces so that they can be easily integrated with the browsers. 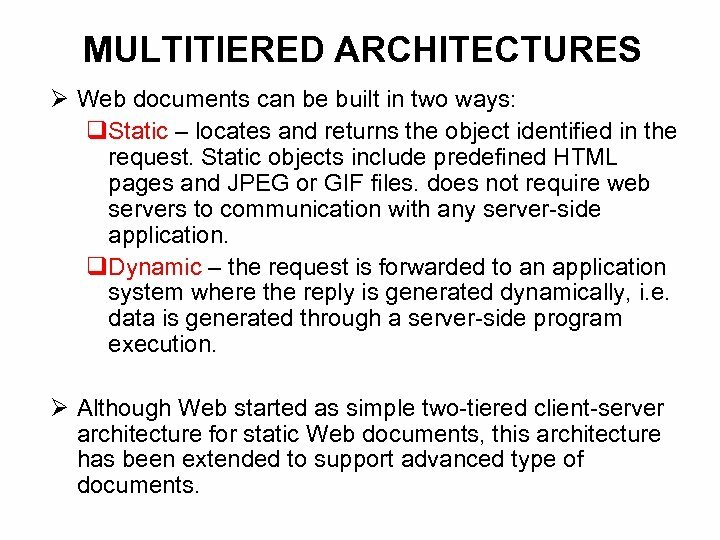 MULTITIERED ARCHITECTURES Ø Web documents can be built in two ways: q. Static – locates and returns the object identified in the request. 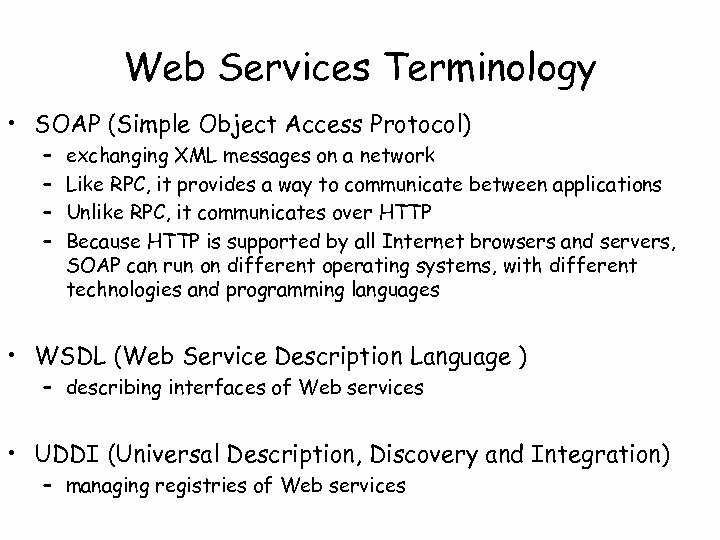 Static objects include predefined HTML pages and JPEG or GIF files. 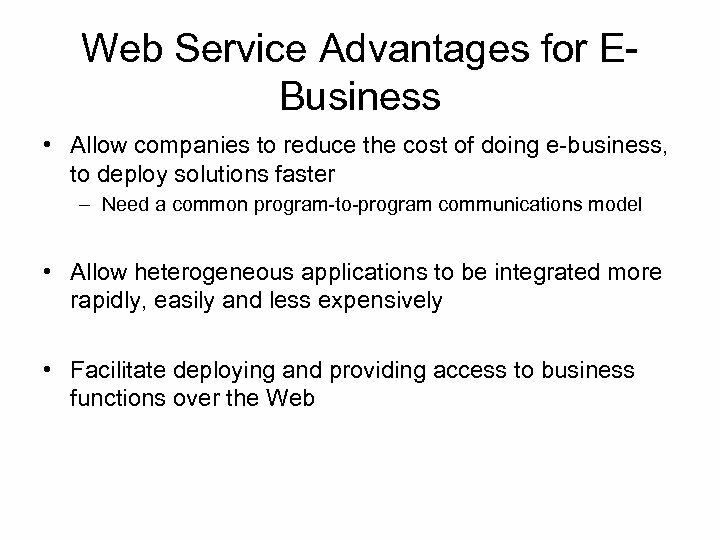 does not require web servers to communication with any server-side application. q. 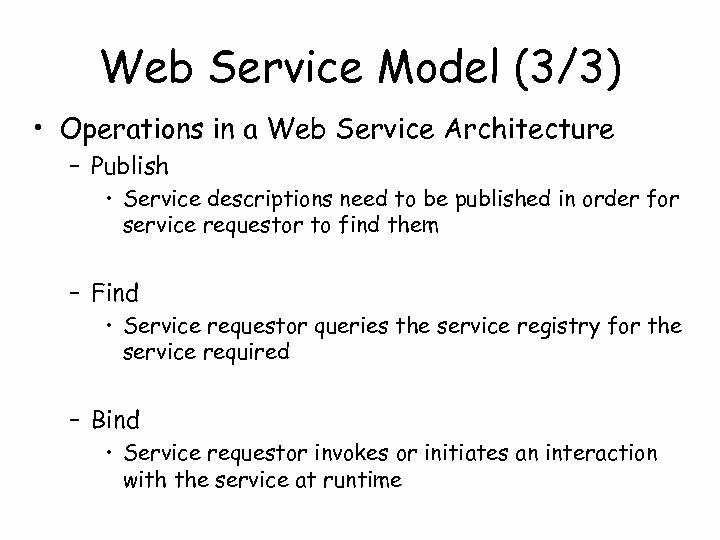 Dynamic – the request is forwarded to an application system where the reply is generated dynamically, i. e. data is generated through a server-side program execution. 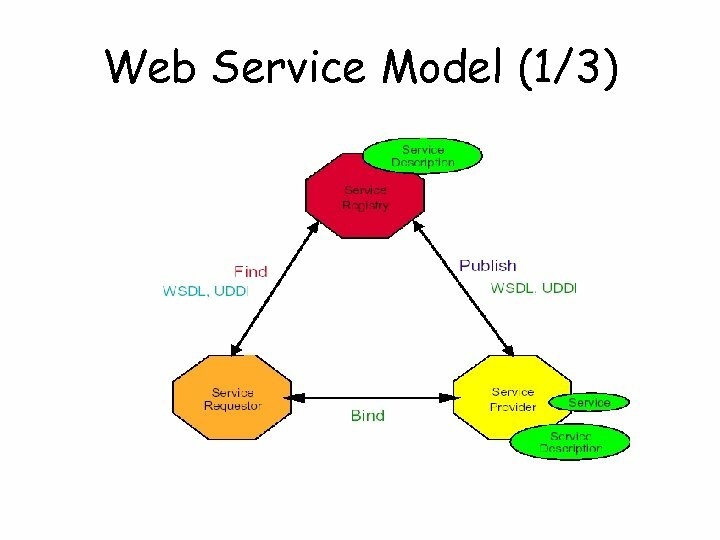 Ø Although Web started as simple two-tiered client-server architecture for static Web documents, this architecture has been extended to support advanced type of documents. 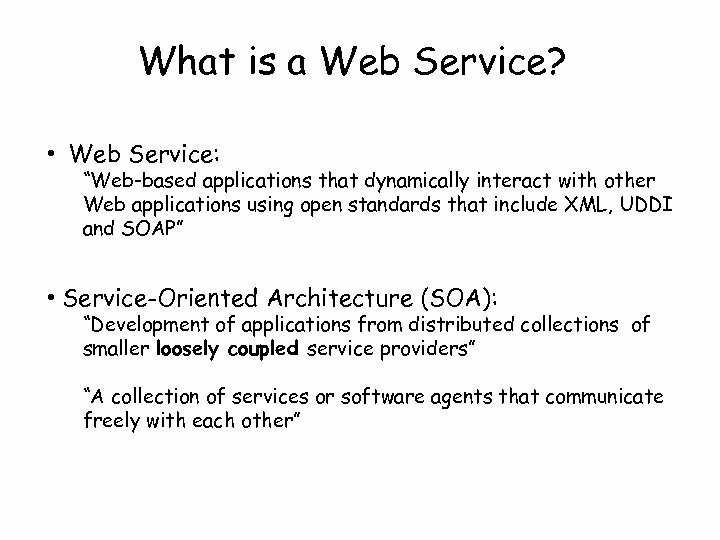 • What is the most popular Web server software? 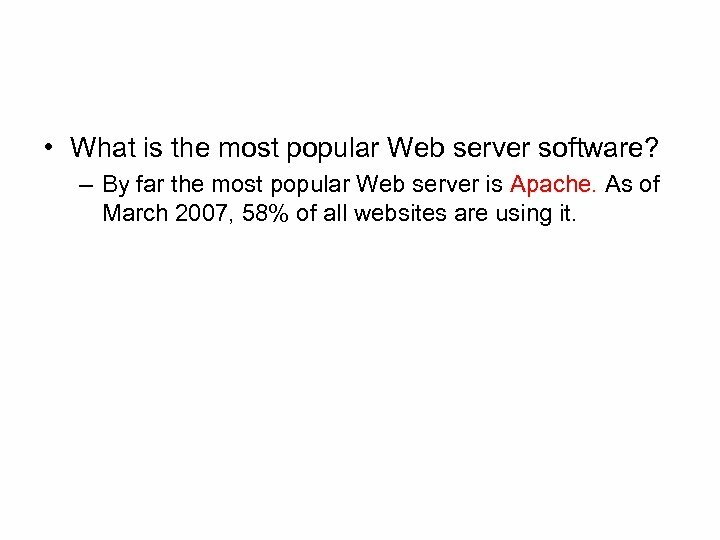 – By far the most popular Web server is Apache. As of March 2007, 58% of all websites are using it. 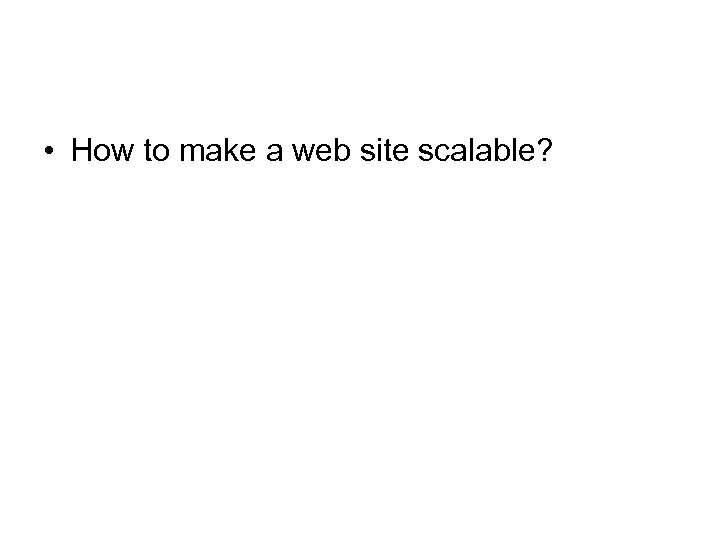 • How to make a web site scalable? 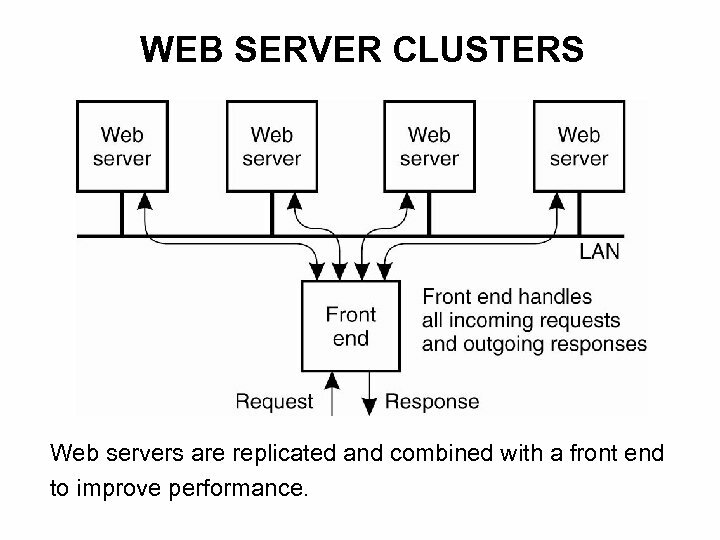 WEB SERVER CLUSTERS Web servers are replicated and combined with a front end to improve performance. 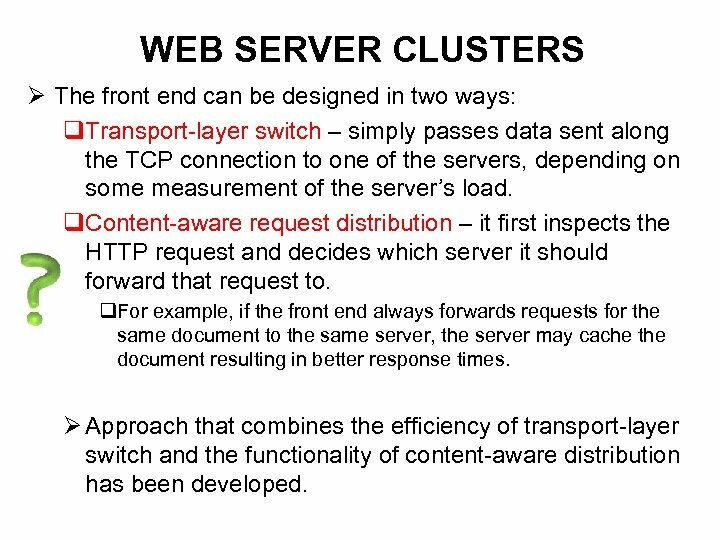 WEB SERVER CLUSTERS Ø The front end can be designed in two ways: q. Transport-layer switch – simply passes data sent along the TCP connection to one of the servers, depending on some measurement of the server’s load. q. Content-aware request distribution – it first inspects the HTTP request and decides which server it should forward that request to. q. 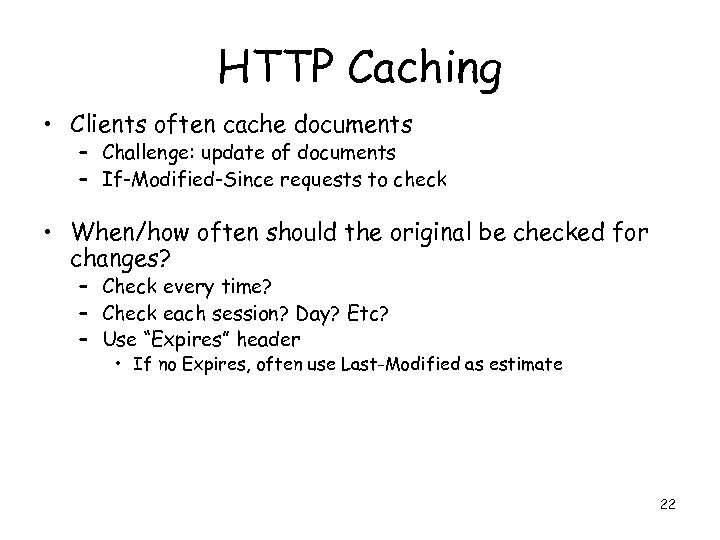 For example, if the front end always forwards requests for the same document to the same server, the server may cache the document resulting in better response times. 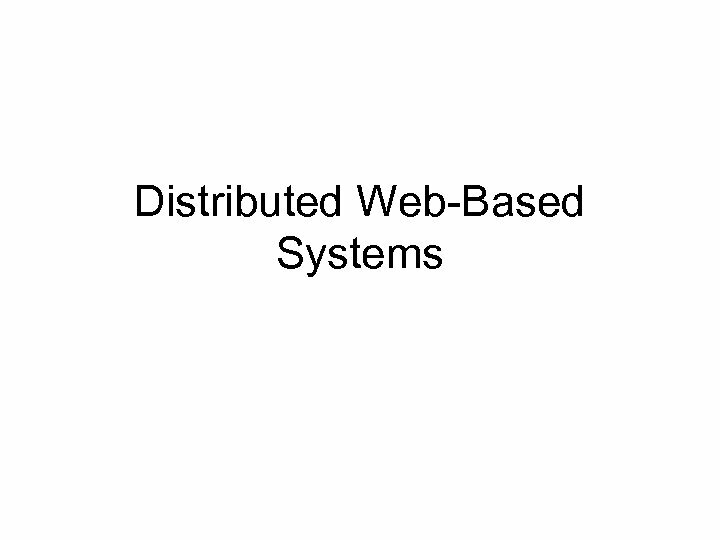 Ø Approach that combines the efficiency of transport-layer switch and the functionality of content-aware distribution has been developed. 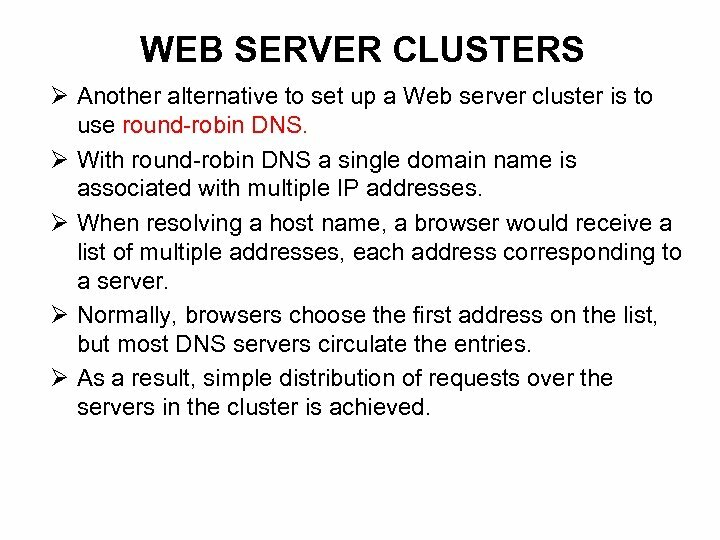 WEB SERVER CLUSTERS Ø Another alternative to set up a Web server cluster is to use round-robin DNS. Ø With round-robin DNS a single domain name is associated with multiple IP addresses. Ø When resolving a host name, a browser would receive a list of multiple addresses, each address corresponding to a server. 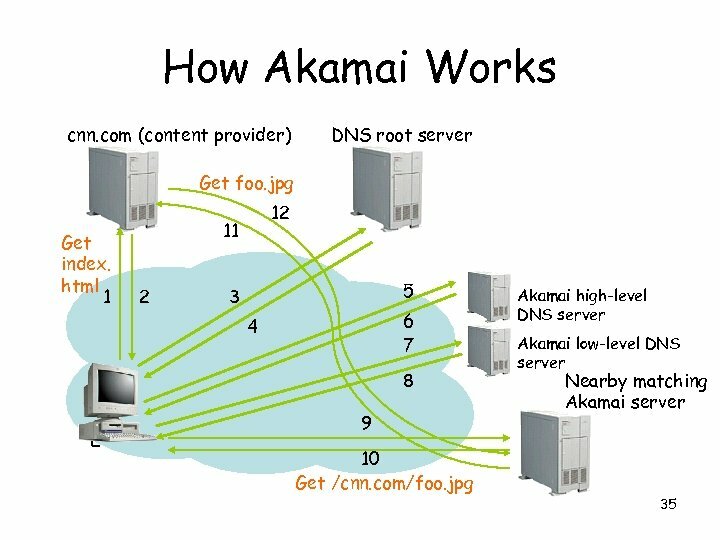 Ø Normally, browsers choose the first address on the list, but most DNS servers circulate the entries. 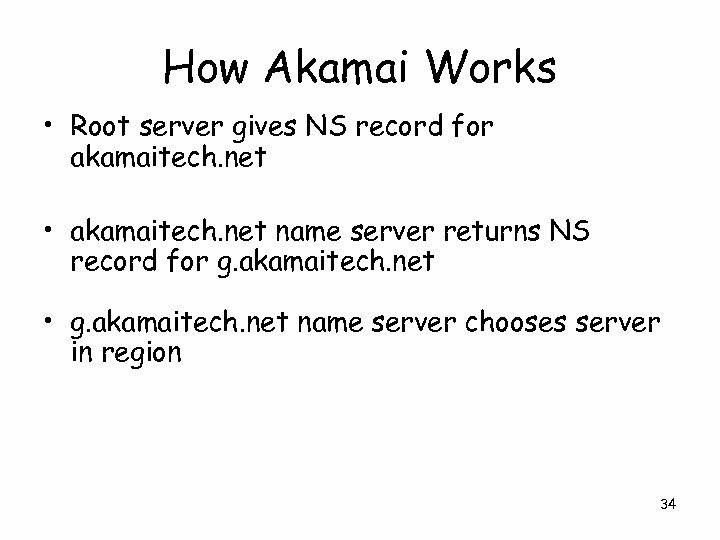 Ø As a result, simple distribution of requests over the servers in the cluster is achieved. 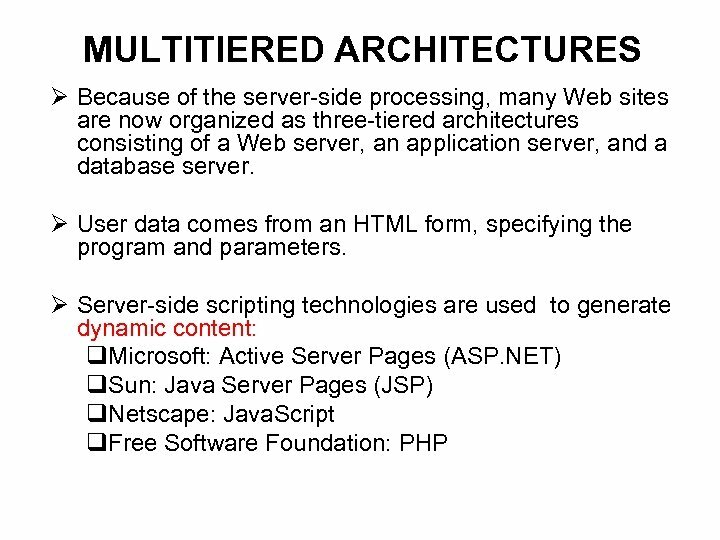 HTTP CONNECTIONS Ø A Web document is constructed from a collection of different files from the same server. 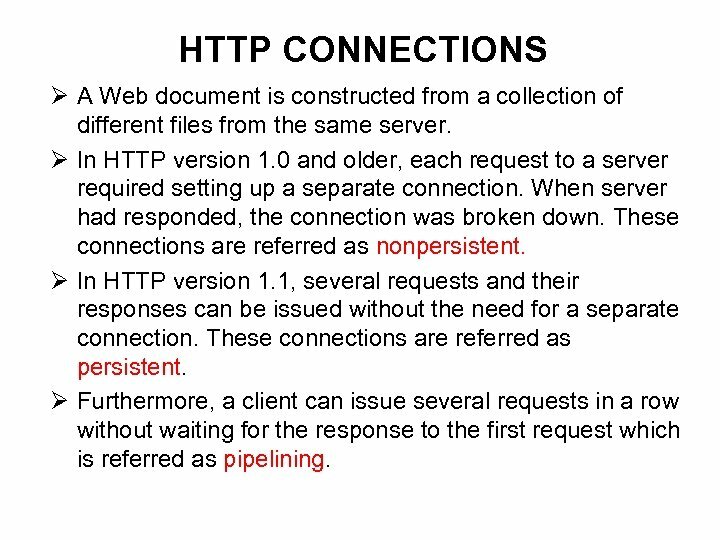 Ø In HTTP version 1. 0 and older, each request to a server required setting up a separate connection. When server had responded, the connection was broken down. These connections are referred as nonpersistent. 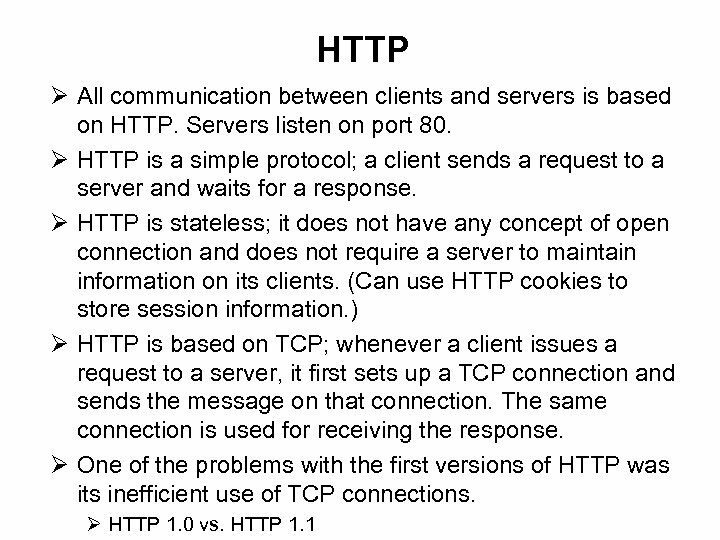 Ø In HTTP version 1. 1, several requests and their responses can be issued without the need for a separate connection. These connections are referred as persistent. 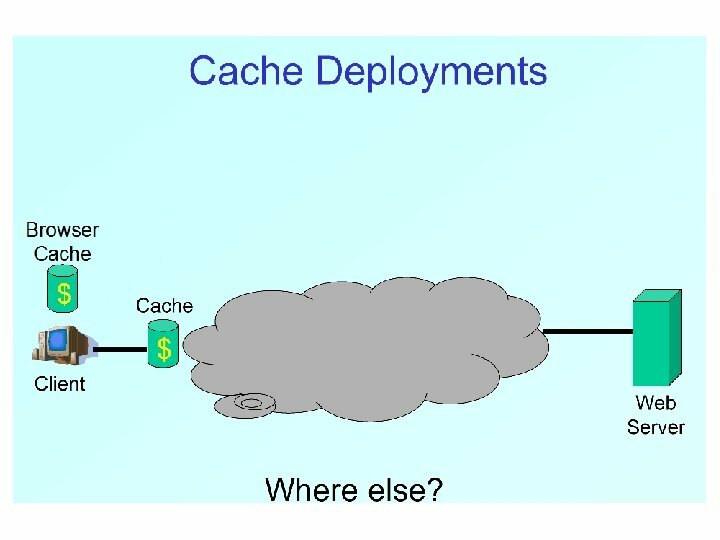 Ø Furthermore, a client can issue several requests in a row without waiting for the response to the first request which is referred as pipelining. 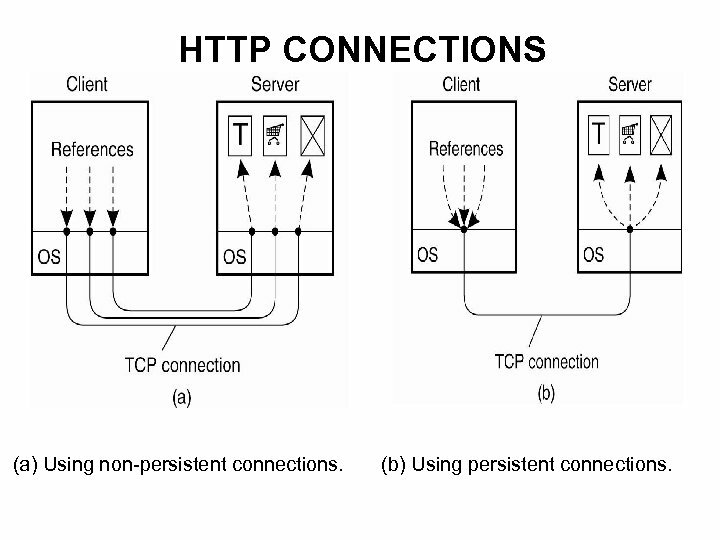 HTTP CONNECTIONS (a) Using non-persistent connections. (b) Using persistent connections. 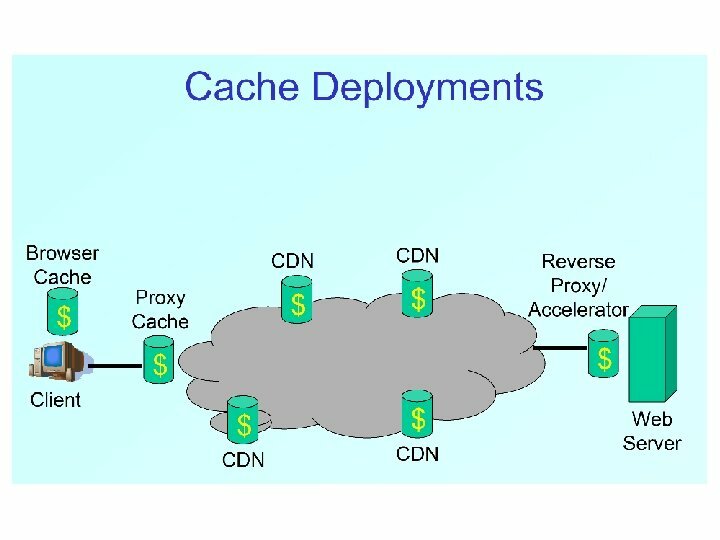 CDN’s Challenges • • • How to replicate content? Where to replicate content? How to find replicated content? How to choose among known replicas? 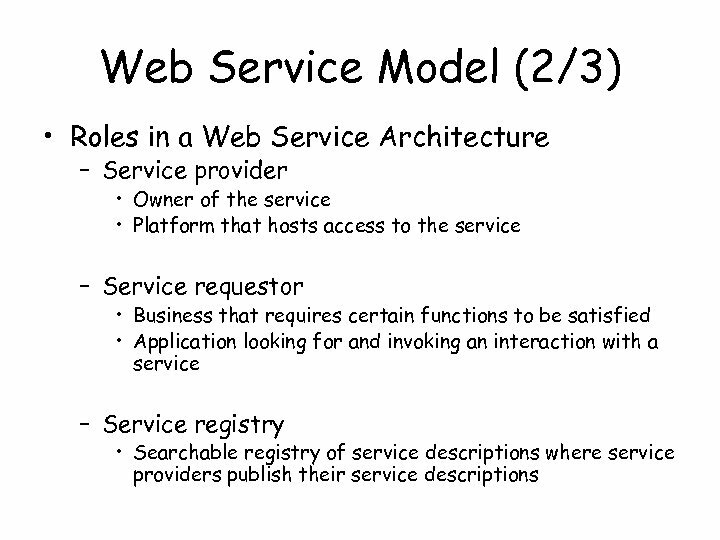 How to direct clients towards replica? 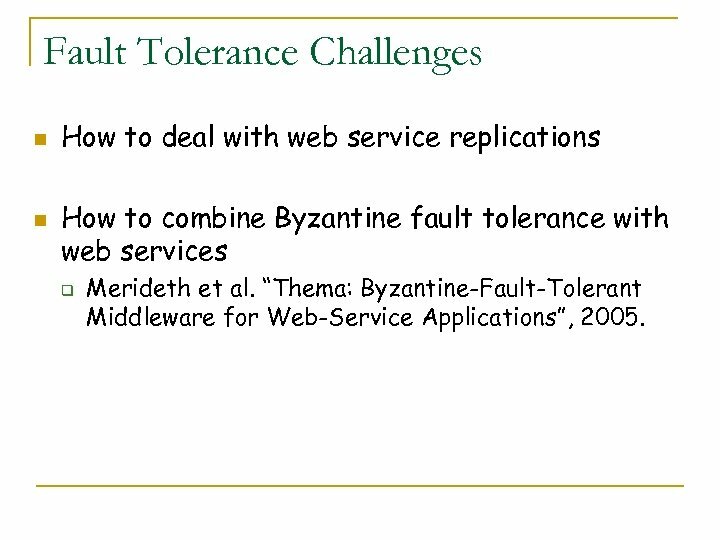 Fault Tolerance Challenges n n How to deal with web service replications How to combine Byzantine fault tolerance with web services q Merideth et al. 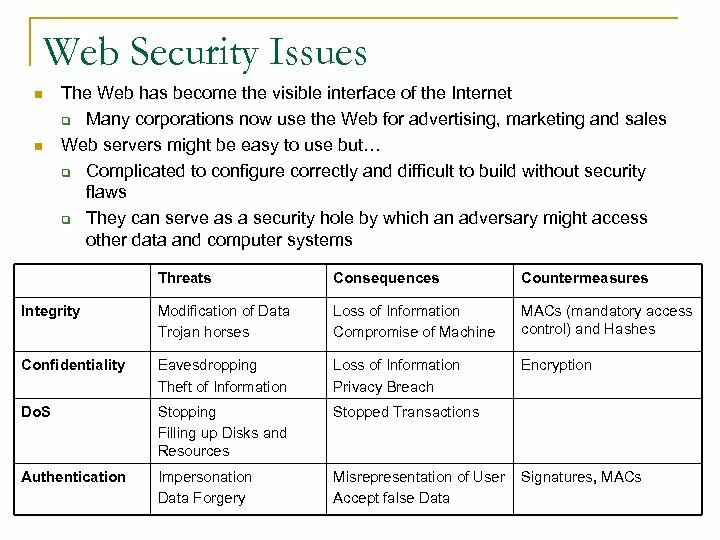 “Thema: Byzantine-Fault-Tolerant Middleware for Web-Service Applications”, 2005.